Final products are defined for every project (e.g., “apartments” would be the final product of a construction project). The cost of the project is determined by the price of the final products. Other parameters include: the project manager, the starting date, the project type, the customer and contacts. 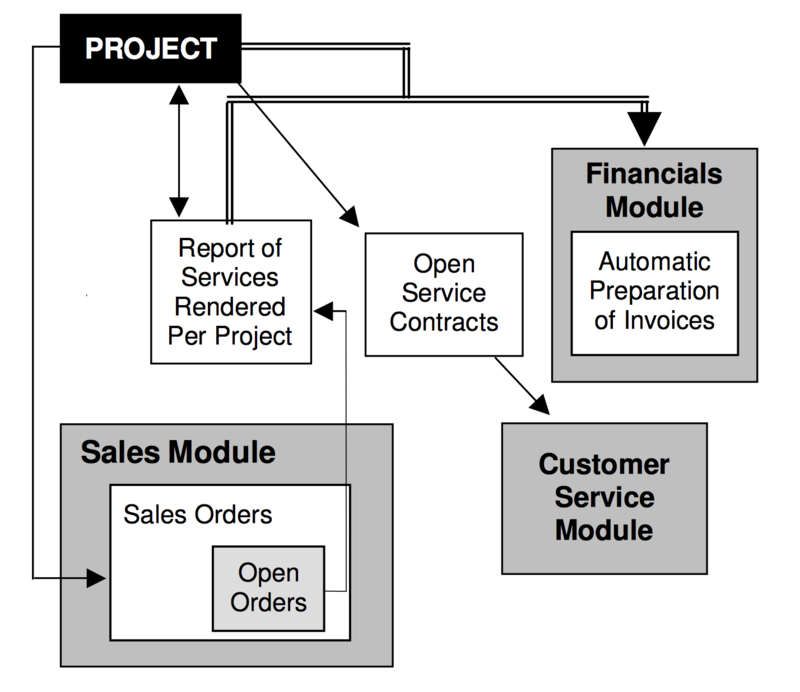 Before you begin planning a project, you can list your customer’s objectives in a Scope of Work (SOW) document. This document consists of a numbered hierarchy of requirements and sub-requirements, which can include extensive remarks explaining each requirement. Each requirement can also be linked to its own final product, where the price of the product determines the price of the requirement. During project planning, you can link each activity to the requirement it is intended to fulfill, and thus calculate the requirement’s projected cost and profit. If you are working with planning versions, you can then create sub-activities automatically from the sub-levels of the linked requirement. SOW documents can be imported from Word files provided by the customer. You can maintain versions of each SOW document, as well as versions of the remarks recorded for individual requirements. Priority allows you to copy an entire SOW document from one project to another and revise it as necessary. You can plan a project in MS-Project and then import the file into Priority, from within the Projects form. The system imports the hierarchical structure of activities (WBS), including their start and end dates, the human resources assigned to each activity and additional details. Each time you import an updated version of the MS-Project file into Priority, only those activities whose data have changed are updated. Activities in Priority are identified by their name (rather than their WBS number), such that any change in the WBS of a given activity, caused by the addition or deletion of a related activity, has no adverse effect on stored data. Each activity in a project generally results in some kind of product. In Priority, you can define final products for activities (e.g., the product of the activity “installing electricity” in a construction project would be “electrical system”). After assigning a product to an activity, the product’s child parts are listed automatically as the activity’s planned materials. You can add to, change or delete these materials, as required for the activity. When activities require the purchase of raw materials or products, Priority provides a mechanism for opening purchase requisitions or purchase orders for them automatically. When you import a project file from MS-Project, you also receive the names of the people assigned to activities. Priority identifies each imported name with the appropriate person, and lists the people assigned to an activity in a separate form. The system automatically assigns to each person on the list his or her default work hour type (for example, a work hour of type “instruction” will be assigned to those people defined as instructors). Each work hour type is assigned a catalogue number and a monetary value; the system multiplies each catalogue number by the number of hours of that type required for the activity (according to the data imported from MS-Project) and the total cost is added to the activity’s human resources cost. You can also record a work schedule (start and end dates and times) for the people performing a given activity. The resulting schedule is updated automatically in the Task Log and in each worker’s calendar (when synchronizing with Outlook, the appointments are updated there as well). Priority provides a special OLAP report displaying human resource data for projects, in which you can view the planned hours for each project activity, daily tasks created for project activities and reported hours for each activity and/or task. Each activity displays total planned costs for human resources and materials, which are updated automatically with each revision of the project plan. In addition, every activity displays its cumulative cost (the total planned cost of its sub-activities), which is calculated by a special program. Actual costs are compared to planned costs in a separate form, where they are displayed per category. Cost categories are organized so that no cost is taken into account more than once. For example, GRVs for which purchase invoices have not yet been issued appear in the Unbilled GRVs category; after billing, these costs are transferred to the Vendor Invoices category. You can view the component costs of each category in a sub-level form. Planning data can be viewed against actual data both on the activity level (which includes the sum of its sub-activity data) and on the project level. A sub-level of the Projects form provides a summary of all actual revenues and costs, as well as projected revenues from the project. All financial and inventory transactions, issues and subproject costs are included in the calculations. Accompanying sub-level forms provide details for all the figures appearing in the form. You can save a version of the project plan at any stage in the project planning. You can then view all of the project’s previous versions in a separate form. Saving versions is particularly recommended if significant changes have been made in the project plan, and you are about to perform an update from an MS- Project file. You can also copy an existing version of the project plan, make manual changes to the copy and save it as a new version. Inventory transactions and financial transactions are reported against the project or a project activity by linking the transaction document to the project or activity. You can also link line items within a document to a project or activity. Work hours and other expenses (such as travel) are reported in a separate form. You can also report work hours to a project on the Internet, via the HTML interface. When opening a document on the basis of another document (e.g., an invoice based on a sales order), the linkage to a project or activity is copied into the new document. Transfer of inventory to a project can be performed in Priority through customer shipments, transfers to project warehouses, receiving goods into inventory or issues from project warehouses. • Customer shipments and transfers to project warehouses charge the project for the transferred inventory. • Issues from project warehouses do not charge the project for the issued inventory. • Receiving goods into inventory charges the project for the inventory. If the inventory is received into a warehouse other than a project warehouse, the system posts a warning. Payments due from customers for the project are recorded in a separate form. Payments can be linked to activities that are marked as milestones. When reporting a completion status of 100% for activities that are linked to a payment, the payment is released for billing. When preparing invoices automatically (see below), the system prepares an invoice for the released payment. • Service contract payments that have fallen due. Priority allows you to open service contracts automatically for final products with defined service parameters. Two additional reports, Tasks per Project and Tasks per Project Activity, are accessible from the CRM Reports menu in the Marketing and Sales module.